Weight as Delivered: ~17 oz (482 g), including hook and suspension ropes. 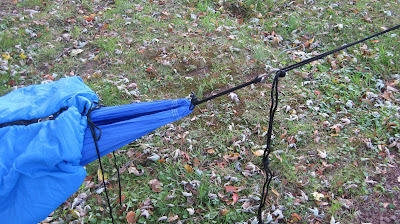 The TTTM Compact Hammock is a HAAB (Hook and attached bag) style hammock. It appears to be a shortened variation of their ‘Single’ HAAB hammock. The hammock is made from nylon silk and comes standard with a steel hooks and ropes for suspension. The suspension ropes are around 84" (213 cm) in working length. As a lightweight backpacker and also a scout leader I was impressed by this little hammock. I have used different brands of HAAB hammocks in the past but none of them appear to have the same quality stitching and attention to detail that this TTTM has. 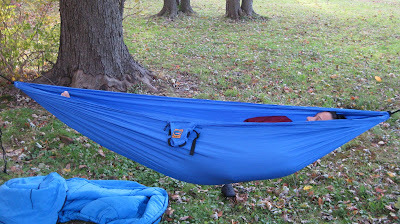 In addition this is the first relatively inexpensive HAAB hammock that I think will hold up to the stress of young boys. I also like the fact that it is shorter than most HAAB hammocks. This is good for smaller frame people as it will be a better fit and less weight to carry. Up to this point in time I have not been able to sleep an entire night in the hammock, but have clocked around three to four hours experimenting with it. I will be taking it into the field in the next month and will be able to give a more detailed experience with it. I did not find a single crooked or loose stitch on the entire hammock. In addition I like the silk nylon as it is more comfortable for me to lay on and also stronger than the materials being sold on some of the other HAAB hammocks brands. 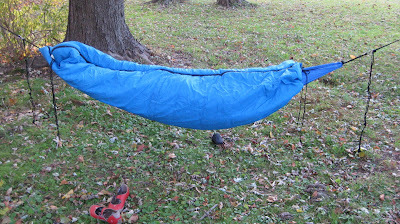 The hammock width feels to be about the same as a normal HAAB style hammock and feels as stable. The hammock like other HAAB styles is very easy to setup. My only gripe about the hammock is the suspension system, which to be fair is my gripe with all HAAB hammocks no matter the brand. It is easy to use but it is heavy and would damage the trees as is. I would like to see them sold with straps so that a camper/backpacker doesn’t have to immediately go and buy more materials to create a more appropriate system. However if the user is not hanging the hammock from trees then I think the ropes would be fine granting that you find supports within the length of the ropes. With that said, even if they are sold with ropes you can always upgrade the suspension for relatively cheap. 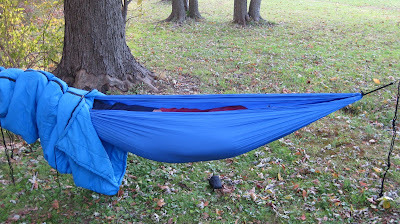 The hammock packs down to the size of a softball and has a compression strap integrated into the bag. 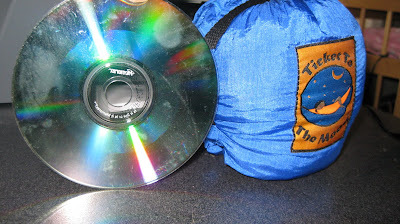 I love the integrated bag as far as packing it up, especially for Scouts. I would probably not use the little black bag that comes with the pack to hold the suspension system, especially since I will be replacing the ropes. I think this hammock is very comfortable. However, due to its shortened length, I found that it was not as comfortable for me to lay in it with the normal amount of sag that I use on my longer hammock. This was mainly because I couldn’t lay as flat as I like. I did hang it much tighter and found that I could lay flat but with noticeable shoulder squeeze. My wife got into it and found it to be perfect. She is two inches shorter than I am and also has much narrower shoulders. She liked it so much she already has claimed it as hers. With that said, I would still be able to sleep through the night in this hammock in comfort and would do so long before ever going back to the ground. I would just need to make sure I had something under my knees to relieve any pressure. One neat thing that I like about it shorter length is that you can use a normal length sleeping bag as a ‘Peapod’ knockoff. This is especially important for my scouts as the majority of them do not have the money to get an actual down under quilt or real Speer Peapod. A normal length sleeping bag seems to be perfect as far as covering your entire body and would help to extend it into full three season use. 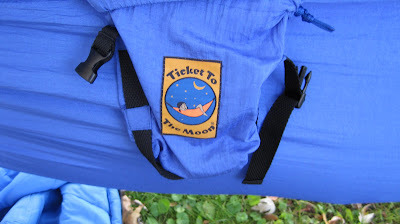 In summary I think this is a great hammock and a good addition to the TTTM line. I think this hammock could become a favorite of Scout troops as it meets the need of providing an inexpensive, quality, durable product that would fit the majority of the scouts. Thanks to TTTM for giving me this opportunity, they have definitely sold me on the quality of their workmanship and also their dedication to the hammock community.